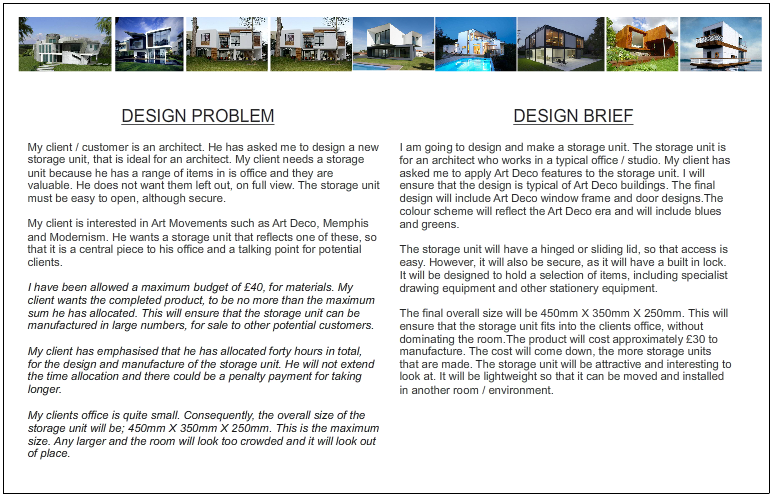 In the Design Problem, you wrote about the ‘design problem’ set by your client / customer. 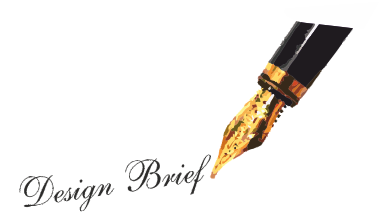 In the Design Brief, you will be writing about, how you intend to solve the problem. What are you going to design and make? E.G. I am going to design and make a storage unit. E.G. I am going to design and make a photograph frame. Now add more detail. Who is the product for? E.G. The storage unit is for an architect who works in a typical office / studio. E.G. The photograph frame is for a student who is currently studying Art Movements at university. What extra details has your client / customer asked you to apply to the product you are going to design? E.G. My client has asked me to apply Art Deco features to the storage unit. I will ensure that the design is typical of Art Deco buildings. The final design will include Art Deco window frame and door designs. E.G. The colour scheme will reflect the Art Deco era and will include blues and greens. E.G. The storage unit will have a hinged or sliding lid, so that access is easy. However, it will also be secure as it will have a built in lock. E.G. The final overall size will be 450mm X 350mm X 250mm. This will ensure that the storage unit fits into the clients office, without dominating the room. What will be your cost limitations? E.G The product will cost approximately £30 to manufacture. The cost will come down, the more storage units that are made. E.G. The storage unit will be attractive and interesting to look at. It will be lightweight so that it can be moved and installed in another room / environment.